Now this is not humor for everyone. A good litmus test is to try out the title "The Spirit of Christmas" or the transcript for the unused commentary for The Lord of the Rings. If these ideas don't grab you, this might not be your cup of tea. But, if you are like me, this unique collection of eccentric humor will be a treasure you'll feel lucky to have found. Now more than ever, Americans are troubled by questions. As sweaty modernity thrusts itself upon us, the veil of ignorance that cloaked our nation hangs in tatters, tattered tatters. Our "funny bones" are neither fun nor bony. Glum is the new giddy, and the old giddy wasn't too giddy to begin with. Unused Audio Commentary by Howard Zinn and Noam Chomsky, Recorded Summer 2002, for The Lord of the Rings: Fellowship of the Ring DVD (Platinum Series Extended Edition), Part One. And much, much more, including 20 brilliant new lists . 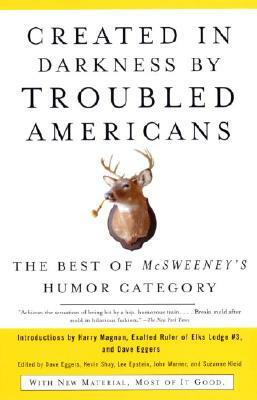 . .
McSweeney’s is a small group that sells taxidermy equipment and also produces books, a literary quarterly, and The Believer, a monthly review. Based in San Francisco, McSweeney’s is also home to 826 Valencia, a nonprofit educational center for Bay Area youth.